This issue had a couple of pretty patterns (Including Carol Ventura’s amazing Whole World Coat in tapestry crochet) but what really caught my eye was an article describing Judith Copeland’s Modular Crochet — classic crochet book from the seventies — in great detail. The article had a really nice biography of Ms. Copeland and instructions and schematics for producing your own version of her sweater construction. When I was searching for examples of modular crochet to show in this post, I came upon the amazing blog of a longtime crocheter and new knitter. She has such detail about how she designs and constructs her garments–it’s really fun to read about her successes and challenges. I can’t find her name anywhere on the blog, but here’s a link to a sweater she made in the modular style. 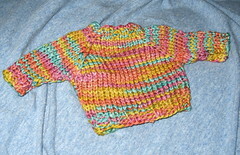 If you’ve made any modular crochet garments or top-down crochet sweaters e-mail me and I’ll post pictures here. The book is neatly laid out with clear instructions, schematics where appropriate and charts in some cases. There’s an index and a bibliography, but little information about where the original pictures came from or which designers created which modern versions. Oh, one other plus for crocheters out there–finally, a book with more crochet than knitting patterns!